DC journos and wonks memorize their lines and don period costumes at the Picnic Theatre Company’s one-act performance of “The New York Idea.” Written in 1906 by Langdon Mitchell, the play is a turn-of-the-last century American social comedy of manners about dating, marriage, and divorce. Directed by 18th St. Films’ Karim Chrobog, the cast includes NPR’s Nurith Aizenman, Bloomberg’s Sandrine Rastello, USTR’s Christina Sevilla, PBS’s Daniela Kelley, Office of Rep. Alan Grayson’s Matt Stoller, Department of Defense’s John Plumb, Wiley Rein’s Nova Daly, EPA’s Charles Kovatch, and Malmaison restauranteur Omar Popal. Proceeds support Dropinthebucket.org, building wells for primary schools in Africa, the Dumbarton House, and the Phillips Collection. The ‘party theater for charity’ kicks off tonight at the Dumbarton House gardens in Georgetown through Friday and at the Phillips Collection on June 26. 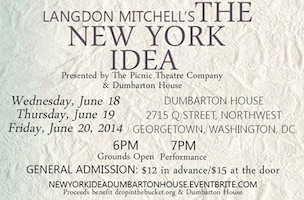 For tickets, click here (Dumbarton House) or here (Phillips Collection).